Super Cool Summer Drinks – Healthy too! From Rodale, the 7 Best Drinks of Summer include a Metabolism Charger Smoothie, a creative mix of green tea, vanilla yogurt, mango and honey. Their Watermelon Health-Booster Smoothie is packed with phytonutrients, natural compounds that trigger healthy reactions in the body. At the end of a frazzled day in the heat, this drink is an easy snap to prepare. Just toss in chopped watermelon, fat free milk, ice and blend. A refreshing (and slimming) 56-calorie drink. Prevention highlights 5 drinks to beat the summer heat. With tropical overtones, Passion Fruit-Pineapple Punch blends delicious passion fruit nectar, pineapple juice, lime juice (fresh, of course) and coconut milk topped off with a spritz of lemon or lime seltzer. Basically strawberry lemonade, their Strawberry Shag with a twist of basil can be combined with either vodka and soda water or you can hold the vodka and add a bit more soda water instead. Dr. Weil checks in with a versatile recipe for a Yogurt-Lime Drink. Ingredients include coconut milk, lime juice, honey, purified water, vanilla and a flavorful combo of spices — cloves, nutmeg and cinnamon. 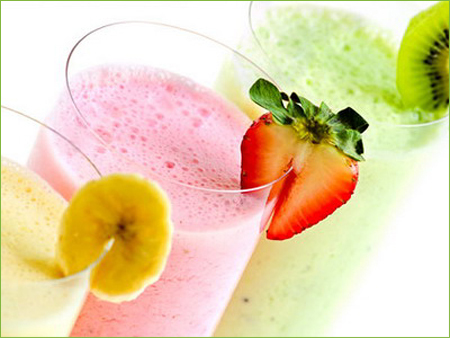 Blend with fresh fruit for a frothy, chunky fruit beverage. Another possibility is tossing in frozen fruit to create a lightly spiced, mellow dessert drink. What’s your favorite cooling summer drink? I make something that is juiced cucumber, a squirt of lemon and seltzer water. It is very refreshing, although I can’t vouch for any health benefits. That’s a new one on me, Terri. but it DOES sound refreshing. Also beneficial in the low calorie department. The drinks all sound delicious. My favorite Summer drink is plain old sun tea. Otherwise, plain old water. Almost missed your comment. No internet for over 16 hours yesterday and today. Real fun dealing with Time Warner kid reading from script who didn’t have a clue how to get my service reactivated (once the internet outage was supposedly over) and who suggested I call Apple for advice and who then hung up on me when I told him what I thought of that idea. Thankfully service popped back on few minutes later. What IS sun tea by the way? Do you have cable modem service? I usually reboot the cable modem and also reboot the router. Not everyone has a router — it’s only needed for in-home wireless. Sun tea is made by letting the tea bags sit in water in the sun. It takes hours to steep but it’s really good. I can send you a recipe if you want one :). I always reboot and turn modem on and off a couple of million times. Eventually internet seems to pop back up on its’ own. Love the idea of tea steeping in the sun, but I have lots of uninvited terrace guests: wire eating birds, roosting pigeons, occasional squirrel. Would it work inside? I make ice coffee by letting it steep in cold water overnight. Would that work with tea?